I hope this is not the only Valentine mail to hit your inbox. Yet, may I wish you the best of success in love and other romantic feelings. Remember, there, unlike in fencing, you want double hits... Tonight, please feel free to bring your chosen one to the fencing salle. Do use all the necessary equipment and give them a good lesson. Sweaty warm up and stretching followed by a few enthusiastic thrusts will make a superb Valentine celebration and you'll be rewarded later in the year, again and again. So, let me not waste your precious time today and be as brief as possible with my updates. Just in case it passed by you the details of our visit to Satu Mare fencing club are on http://www.londonfencingclub.co.uk/transylvania.php. The trip is scheduled for 26-30 March. It's pretty full but we can still add 2-3 people as long as notify me a.s.a.p.! Yes, it's good for beginners as well as for everyone else. You can borrow the kit from the club and off you go doing that mysterious gypsy foot work! Click here to see how our hosts are preparing for our arrival. Simon is organizing a friendly visit from Streatham fencing club who it seems will show up this Saturday, 16 February at Finsbury Leisure Centre. They'll be bringing fencers of all different levels and hence we're in desperate need for beginners, i.e. people who wear blue jackets and use non-electric foils to defend the honor of the club. If you're one of those who just recently completed a beginners' course and want to taste some tournament sweat, please get in touch with Simon on swarwick@netvigator.com. I'd like to thank everyone who took time to sign our online petition Make a Fencing Salle part of the new Finsbury Leisure Centre! I had a meeting with the Council officials earlier this week and did see the print out of the petition in their hands! May I report that the meeting went in a friendly atmosphere and I was re-assured by the officials that 1) They're extremely pleased to have our club residing in their borough 2) Whether or not Finsbury Centre will be demolished and rebuilt or just refurbished, the fencing will be offered alternative premises for the time of the works. 3) They'll look through the database of available spaces in order to find something that could be used as a dedicated fencing salle. I'll obviously keep you updated about all future developments. In the meanwhile if you can think of a large centrally located space which might potentially be used for fencing - please let me know (just in case). 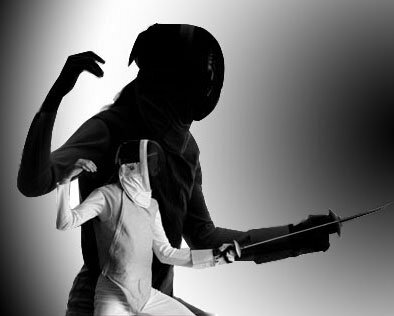 Are you a fencer? A dancer? We are looking for a fencing couple to stage fight to Latin percussion as part of an arts performance event in London. From tap to pole to salsa, fencers will perform alongside an exciting mix of performers.